If I’ve ever been ambivalent about eggs, it was due to the immaturity of youth. I used to think they were too weird for me, and too . . . well, intimate, in an animal kind of way. But I’m past that now. Eggs have become one of the most important ingredients in my kitchen. Like a dog that will do any trick to make you happy, eggs can be your best friend. They’re a wonder ingredient. I would put a little cape on these things if I could. If I haven’t yet convinced you, here’s a survey of wisdom from my cookbook shelf. Curious as I am, I decided to commit myself to the curriculum of eggs. Scrambled, turned into an omelette, boiled, half-boiled, fried, or baked, I look up information about every preparation whenever I make it. One technique I’ve learned tons about is poaching, which can seem intimidating even to the surest hand. A few things about poaching eggs make the heart race a little bit, but don’t let any of it get to you. 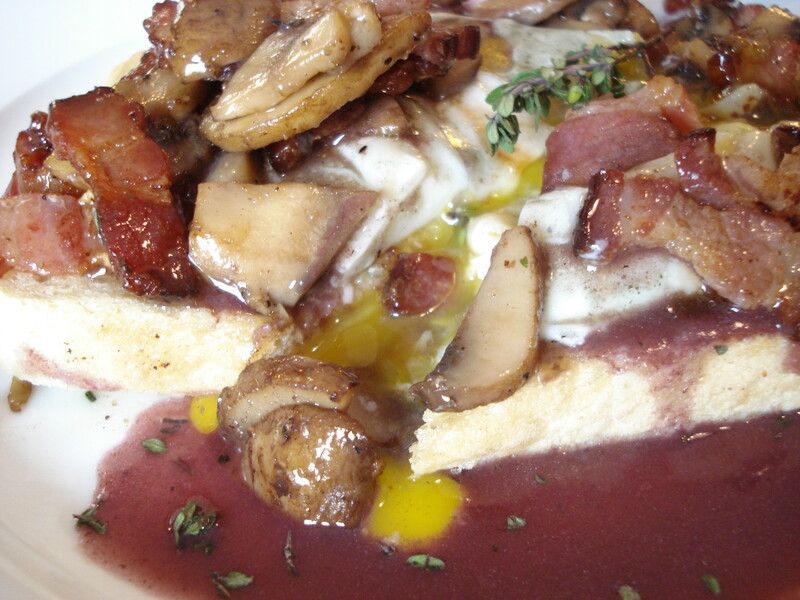 Nothing messes up a poached egg more than your own fear of it, so relax and have fun. Once you have a bit of confidence, get out a saucepan and poach 4 of them all at once. That’s how to really show ’em who’s boss. To poach an egg, crack a very fresh raw egg into a bowl (or many raw eggs into individual bowls), dip about a half inch of the bowl into a simmering saucepan of 3 inches of water, tip the egg out, and cook for 3 to 4 minutes, until the white becomes a firm pillow to carry the still-soft yolk to the plate. One of the challenges of poaching a raw egg is that the whites fly around the yolk like the arms of a simmering octopus. To help fix that, add a tablespoon of vinegar (“acidulate” the water, says Alton), which keeps things together. Lots of people also suggest creating a whirlpool (Martha says, “technically a vortex”) in the water before sliding the egg in, as the momentum traps the whites close to the yolk. This is a cool trick, but for a long time it led me to think you can only poach one egg at a time — and that’s just not true. If you’re poaching an egg for yourself, go for the vortex. 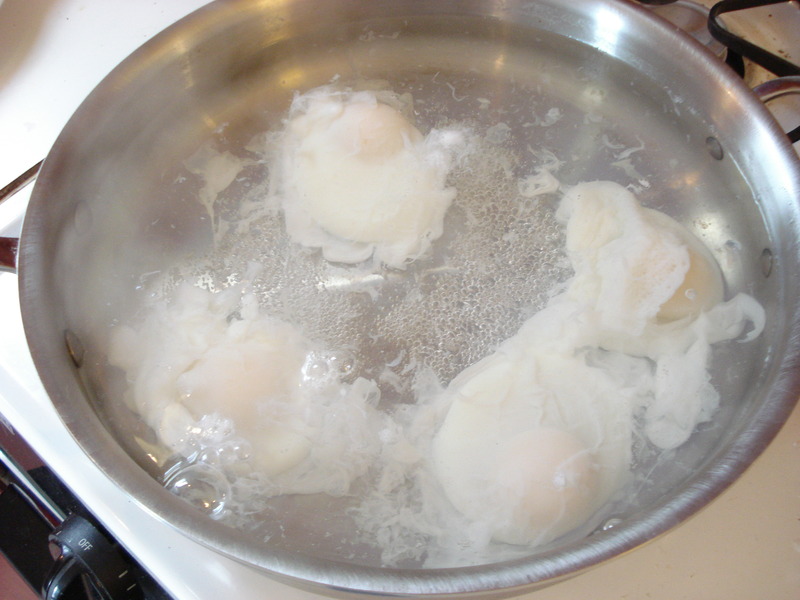 If poaching for a group of people, you can cook up to 4 eggs in the same pan. In this case, skip the vortex. To avoid the octopus effect, after you tip the eggs in, simply push the whites back over the yolk with a wooden spoon and hold there for about 3 seconds. 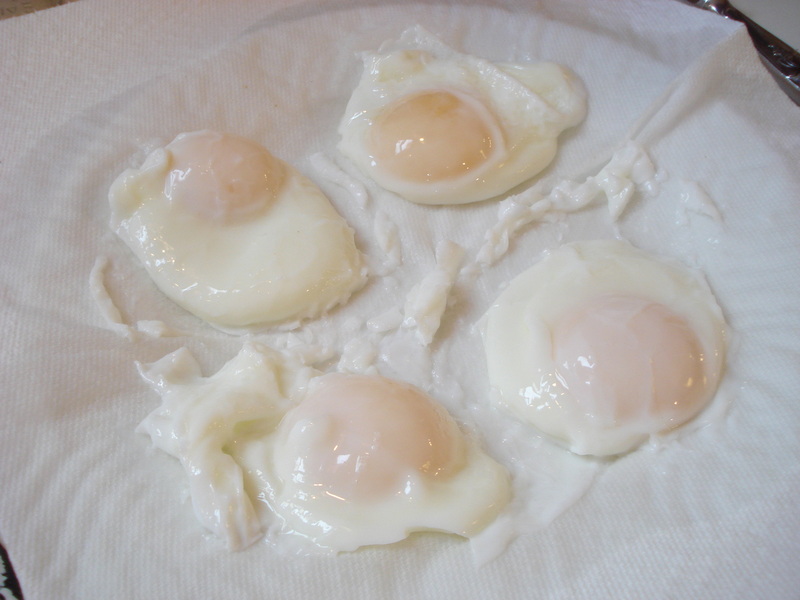 The most useful thing I’ve learned about poaching eggs is their durability. You can put them on a plate covered with a paper towel and trim off the messy edges. If you’re using them in a dish that’s still cooking, put the poached eggs in a bath of hot water until you’re ready to use them. If you really like planning ahead, Alton Brown says poached eggs can be refrigerated in ice water for up to 8 hours and reheated in hot water. I can’t begin to tell you how many things are improved by a poached egg. Maybe that’s what the Internet is for. But in my humble opinion, the crowning glory, the poached egg pièce de résistance, is Oeufs en Meurette, a sensual French dish I stumbled on and fell in love with immediately. I wrote about this dish for my column with Valley Natural Foods. As soon as it’s in circulation, I will share the full recipe here. For now, here’s a hint of all its glory. If you’re lucky enough to wake up next to someone you love on Valentine’s Day, make this for both of you. You’ll be happy you did. This entry was posted in Things I Make on January 31, 2010 by Carrie. I must admit, I rang in 2010 tucked away in the outer boroughs of New York City with R and a large tub of fresh artichokes, which he taught me how to cook based on his grandfather’s old recipe. R adores artichokes. He lights up every time he talks about them. When he was a kid, he wouldn’t let anyone talk to him if he was eating one of the artichoke dishes his large Italian family would put in front of his face. Given how full of life he is, I think they started to use it as a strategy. You can see why I was surprised when R claimed I have an equally passionate relationship with beets. “Your beet is my artichoke, Obry,” he said, going so far as to claim I have a fetish for them. It’s hard to describe just what it is about them. Beets make me sigh. Of all the stuff in the produce section, they’re the most fun to bring home. They’re so awkward, with their and crazy tall greens and peculiar long tails so animated it looks like they could scamper away. I roast beets at least once a week and eat them with any combination of greens, grains, and cheese — or just straight on their own. 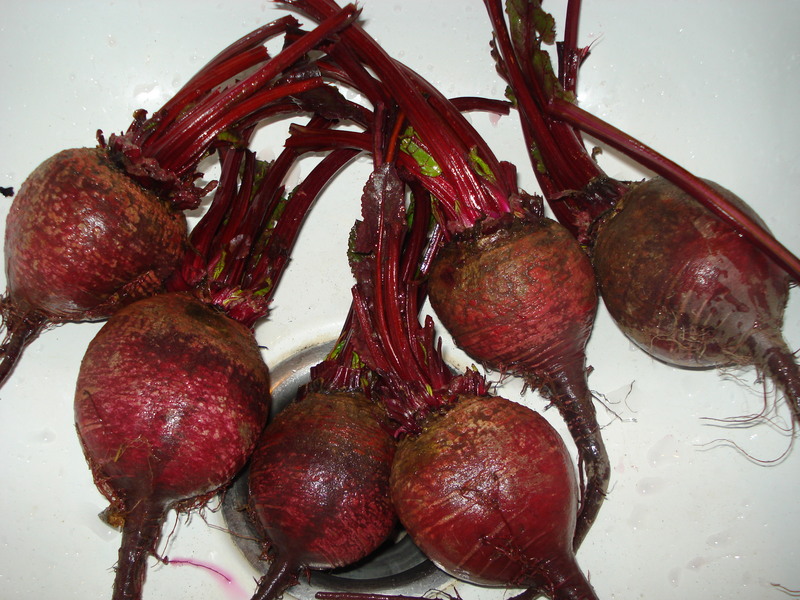 I rarely buy bare beets, as the greens are delicious to eat with nothing but sea salt, shaved raw garlic, and a swing of olive oil. 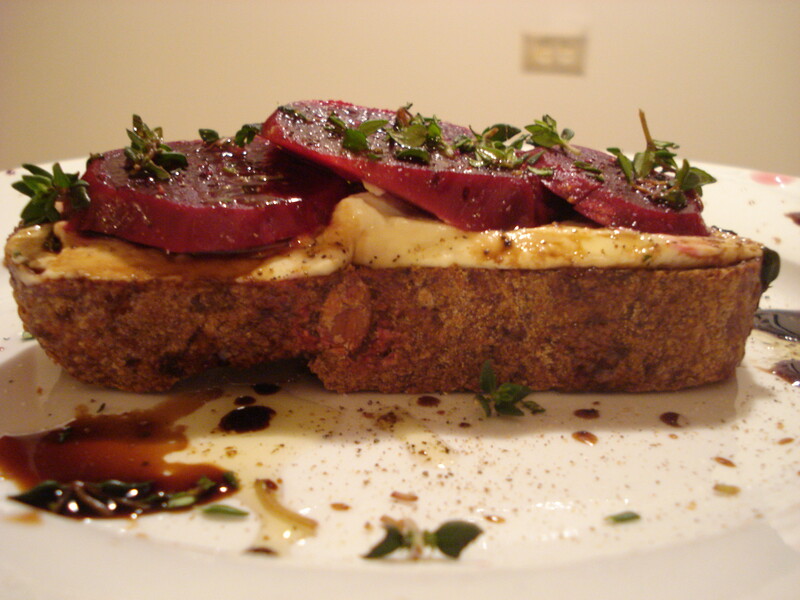 And what else can you do with that beet meat? I had a loaf of Rustica’s whole grain bread and homemade hummus in the fridge, which led to this lovely combination — a roasted beet and hummus sandwich. This entry was posted in Tete a tete (That's French for "dating"), Things I Make on January 26, 2010 by Carrie.